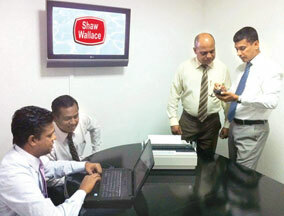 Shaw Wallace Ceylon Ltd is transforming its sales distribution process to a fully automated and integrated distribution system to enhance its sales efficiency and cater to the demands of the industry. Axienta Ltd, which is a specialised organisation in sales force automation systems and mobility solutions are joining Shaw Wallace Ceylon Ltd to implement the process. The initial stage of automation will focus on the FMCG sector and strategies are defined to implement it to other segments. With the automation of the sales force, all field level staff will be equipped with hand- held devices to invoice the process which will be connected to the main server in Colombo where all the secondary sales will be updated automatically. "The sales force automation project at Shaw Wallace Ceylon Ltd is the result of a planned endeavour to identify the right solution to deliver real business value" said Axienta Group CEO Manju Fernando.